This book is for everyone who is involved in snow and ice control in a public agency. It covers materials, application, equipment, weather, and takes the reader from “before the season” to “after the storm” in scope. Sample municipal manuals and policies are also included. After being with the Spring Grove Public Works Department for 13 years, the author, Supervisor Matt Wittum has won several awards for himself and the department. The most recent is his nomination for manager of the year from the American Public Works Association. He won the honor from the Fox Valley Branch and Chicago metro chapter, and now he’s nominated at the national level. The Spring Grove native always has had an interest in snow since he helped his father plow roads growing up, and he’s taken his interest to the public works department to find ways to manage snow and ice removal effectively and on a tight budget. And he gives much of the credit for his success to his team at the department and family. 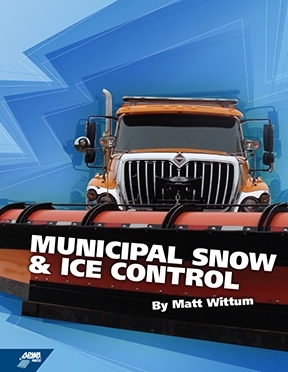 Wittum also has written his own book, “Municipal Snow and Ice Control,” for the association, and has written several articles about snow and ice control for publications in the field.